This article is about the herb. For other uses, see Coriander (disambiguation). “Cilantro” redirects here. It is not to be confused with the related herb Eryngium foetidum, also known as “culantro” or “Mexican coriander”. “Chinese parsley” redirects here. Chinese parsley may also refer to the unrelated herb Heliotropium curassavicum. Coriander (/ˌkɒriˈændər, ˈkɒriændər/; Coriandrum sativum), also known as Chinese parsley, the stems and leaves of which are usually called cilantro (/sɪˈlæntroʊ, –ˈlɑːn-/) in North America, is an annual herb in the family Apiaceae. All parts of the plant are edible, but the fresh leaves and the dried seeds (as a spice) are the parts most traditionally used in cooking. First attested in English in the late 14th century, the word “coriander” derives from the Old French: coriandre, which comes from Latin: coriandrum, in turn from Ancient Greek: κορίαννον, koriannon, derived from Ancient Greek: κόρις, kóris (a bed bug), and was given on account of its foetid, bed bug-like smell. The earliest attested form of the word is the Mycenaean Greek ko-ri-ja-da-na written in Linear B syllabic script (reconstructed as koriadnon, similar to the name of Minos‘s daughter Ariadne) which later evolved to koriannon or koriandron, and koriander (German). Although native to Iran, coriander grows wild over a wide area of Western Asia and Southern Europe, prompting the comment: “It is hard to define exactly where this plant is wild and where it only recently established itself.” Fifteen desiccated mericarps were found in the Pre-Pottery Neolithic B level of the Nahal Hemar Cave in Israel, which may be the oldest archaeological find of coriander. About half a litre of coriander mericarps was recovered from the tomb of Tutankhamen, and because this plant does not grow wild in Egypt, Zohary and Hopf interpret this find as proof that coriander was cultivated by the ancient Egyptians. The dry fruits are known as coriander seeds. The word “coriander” in food preparation may refer solely to these seeds (as a spice), rather than to the plant. The seeds have a lemony citrus flavour when crushed, due to terpenes linalool and pinene. It is described as warm, nutty, spicy, and orange-flavoured. Eryngium foetidum has a similar, but more intense, taste. Known as culantro, it is found in Mexico, South America, and the Caribbean. Papaloquelite is one common name for Porophyllum ruderale subsp. macrocephalum, a member of the Asteraceae, the sunflower family. This species is found growing wild from Texas to Argentina. ^ a b Carly Ledbetter (6 December 2017) [2015-06-24]. “Science Explains Why Cilantro Tastes Like Soap for Certain People”. Huffington Post. Retrieved 12 January 2018. ^ Lewis, Charlton T. “coriandrum”. A Latin Dictionary. ^ Liddell, Henry George; Scott, Robert. “κορίαννον”. A Greek-English Lexicon. ^ “Coriander”, Oxford English Dictionary 2nd ed., 1989. Oxford University Press. ^ Chisholm, Hugh, ed. (1911). “Coriander” . Encyclopædia Britannica. 7 (11th ed.). Cambridge University Press. p. 146. ^ “The Linear B word ko-ri-ja-da-na”. Palaeolexicon. ^ a b Chadwick, John (1976). The Mycenaean World. Cambridge University Press. p. 119. ^ a b c “Coriander (Coriandrum sativum)”. Gernot Katzer Spice Pages. 29 February 2012. Retrieved 1 July 2018. ^ Batmanglij, Najmieh (2 March 2018). A Taste of Persia: An Introduction to Persian Cooking. I.B.Tauris. ISBN 9781845114374. Retrieved 2 March 2018 – via Google Books. ^ Fragiska, M. (2005). “Wild and Cultivated Vegetables, Herbs and Spices in Greek Antiquity”. Environmental Archaeology. 10 (1): 73–82. doi:10.1179/146141005790083858. ^ Samuelsson, Marcus (2003). Aquavit: And the New Scandinavian Cuisine. Houghton Mifflin Harcourt. p. 12 (of 312). ISBN 978-0-618-10941-8. ^ Ramcharan, C. (1999). J. Janick (ed.). “Perspectives on new crops and new uses – Chapter: Culantro: A much utilized, little understood herb”. ASHS Press: 506–509. ^ a b McGee, Harold (13 April 2010). “Cilantro Haters, It’s Not Your Fault”. The New York Times. Retrieved 24 July 2012. Some people may be genetically predisposed to dislike cilantro, according to often-cited studies by Charles J. Wysocki of the Monell Chemical Senses Center in Philadelphia. ^ Moulin, Léo (2002). Eating and Drinking in Europe: A Cultural History. Mercatorfonds. p. 168. ISBN 978-9061535287. ^ Bruce Smallfield (June 1993). 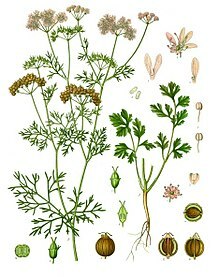 “Coriander – Coriandrum sativum”. Archived from the original on 4 April 2004. ^ “Dhana Jeera Powder – Also Known As Cumin and Coriander Blend or Dhanajiru Powder”. My Spice Sage. Retrieved 14 January 2016. ^ Silva, Filomena; Ferreira, Susana; Queiroz, Joao A; Domingues, Fernanda C (2011). “Coriander (Coriandrum sativum L.) essential oil: its antibacterial activity and mode of action evaluated by flow cytometry”. Journal of Medical Microbiology. 60 (Pt 10): 1479–86. doi:10.1099/jmm.0.034157-0. PMID 21862758. ^ Pendergrast, Mark (1994). For God, Country and Coca-Cola. Collier. p. 422. ^ Brennan, Eric (26 February 2015). “Effective Intercropping for Biological Control of Aphids in Transplanted Organic Lettuce”. eOrganic. Retrieved 4 April 2017. ^ “Nutritional Data, coriander seed, per 100 g”. nutritiondata.self.com. Conde Nast. Retrieved 10 August 2013. ^ Zheljazkov, V. D; Astatkie, T; Schlegel, V (2014). “Hydrodistillation extraction time effect on essential oil yield, composition, and bioactivity of coriander oil”. Journal of Oleo Science. 63 (9): 857–65. doi:10.5650/jos.ess14014. PMID 25132088. ^ Rubenstein, Sarah (13 February 2009). “Across the Land, People Are Fuming Over an Herb (No, Not That One)”. The Wall Street Journal. Retrieved 24 July 2012. ^ Ewen Callaway (12 September 2012). “Soapy taste of coriander linked to genetic variants”. Nature. doi:10.1038/nature.2012.11398. ^ Josh Kurz (26 December 2008). “Getting To The Root Of The Great Cilantro Divide”. NPR. ^ a b Moneret-Vautrin, D. A; Morisset, M; Lemerdy, P; Croizier, A; Kanny, G (2002). “Food allergy and IgE sensitization caused by spices: CICBAA data (based on 589 cases of food allergy)”. Allergie et Immunologie. 34 (4): 135–40. PMID 12078423. ^ Kathleen Pointer (29 March 2017). “How to Recognize a Cilantro Allergy”. Healthline. Retrieved 17 March 2018. ^ Christina Agapakis (18 September 2011). “Allergy Recapitulates Phylogeny”. Scientific American. Retrieved 17 March 2018. ^ a b c Tucker, A.O. ; DeBaggio, T. (1992). “Cilantro Around The World”. Herb Companion. 4 (4): 36–41.